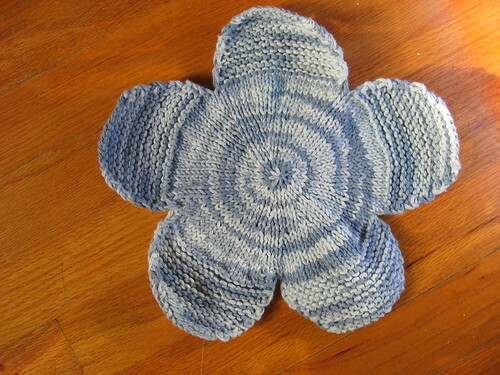 Flower Washcloth, originally uploaded by Craftydiddl. i made one more washcloth for my Grandma before we head off-hey Grumperina makes socks for her grandma and i make washclothes for mine LOL. it is the Flower Washcloth from Weekend Knitting that I mentioned in my last post. I used Lily’s Sugar n’ Cream cottone again and Size 7 circ needles. so not much different besides the pattern on this washcloth. I love these Flower Washclothes-they are super cute and another quick knit! ETA: I am taking yarn to make my Bainbridge scarf (small project) and some socks (i consider socks a big project, mainly because i can’t whip them up like some other people). Enjoy the rest of your Sunday! I am SO going to miss you!!!!!! Have a fabulous trip and be safe too! !